One of the busiest Christmas markets you can visit in Germany is the "Christkindlmarkt" in the historic old town of Frankfurt, Hesse. 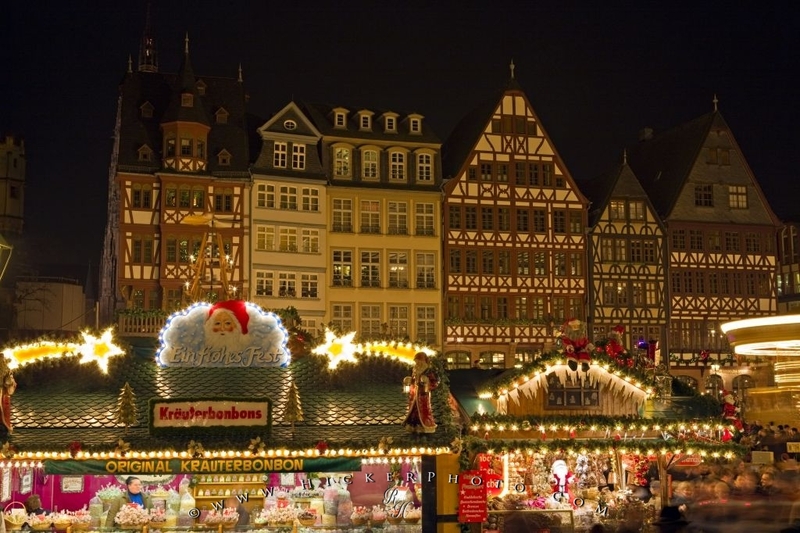 A must see when visiting the city of Frankfurt during December, the Christmas Market at the Römerberg, Frankfurt's historic old town sector, is one of the largest in Germany. Attracting visitors from near and far, the Christmas Market, aka Christkindlmarkt, features a wide selection of market stalls selling crafts, food, and mulled wine. The whole scene is looked over by the historic buildings of the Römerberg. Decorated Christkindlmarkt (Christmas Market) stalls set up in front of buildings in the Roemerberg (City Hall Square) in the City of Frankfurt am Main, Hessen, Germany, Europe. Photo of the annual Christmas Market in the historic old town quarter of Frankfurt, Germany.